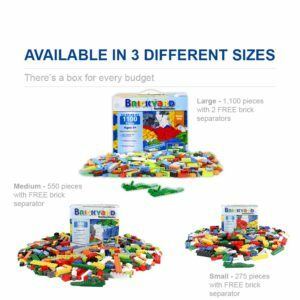 Brickyard Building Blocks Building Bricks – 1100 Pieces Toys Bulk Block Set with 154 Roof Pieces, 2 Free Brick Separators, and Reusable Storage Box, Compatible with Lego is now available at Amazon.com for just $29.95 (REG $59.95) (As of 31 January 2019, 23:31 PST – Details) with $30.00 (50%) Savings. 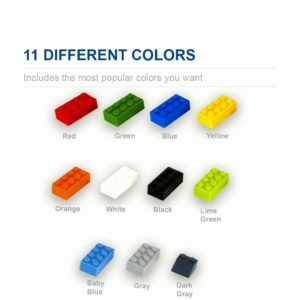 WORKS WITH ALL MAJOR BRANDS – Compatible with Lego. Mix and build with your existing name brand building bricks. 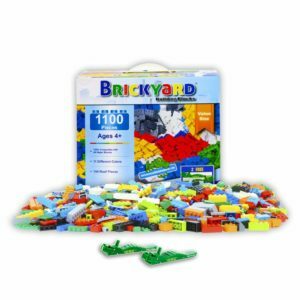 Because we’re SO confident you’ll love our compatible building brick toys, it’s backed by our NO-HASSLE SATISFACTION GUARANTEE. If you don’t love it for any reason, you can return it for a full refund. BIGGER PACKAGE (OVER 3 LBS! ), MORE BRICKS – More building bricks than other sets of similar size. Contains 11 different colors and 154 roof pieces. Excellent supplement to the STEM education curriculum. PREMIUM QUALITY – Made of premium, high quality material that have been tested to comply with all US toy safety standards and are free of lead, cadmium, and phthalates. 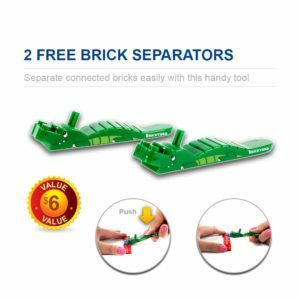 TWO FREE BRICK SEPARATORS – Separate connected bricks and plates effortlessly with this free, easy-to-use tool. REUSABLE STORAGE BOX WITH HANDLE – Collect and store all your bricks conveniently in one place to keep dirt and dust away. The top of the box has a comfortable handle for easy carrying; perfect for travel. More building bricks than other sets of similar size. 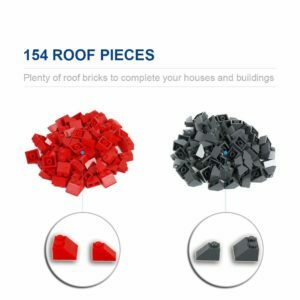 Contains 11 different colors and 154 roof pieces. Excellent supplement to the STEM education curriculum. Compatible with Lego. Mix and build with your existing name brand building bricks. 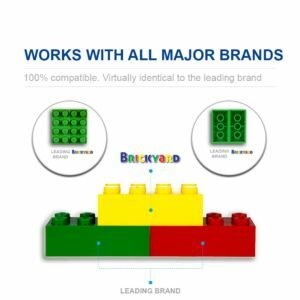 Because we’re SO confident you’ll love our compatible building brick toys, it’s backed by our NO-HASSLE SATISFACTION GUARANTEE. If you don’t love it for any reason, you can return it for a full refund. Made of premium, high quality material that have been tested to comply with all US toy safety standards and are free of lead, cadmium, and phthalates. Separate connected bricks and plates effortlessly with this free, easy-to-use tool. Collect and store all your bricks conveniently in one place to keep dirt and dust away. The top of the box has a comfortable handle for easy carrying; perfect for travel.